Baozhong (包種茶, literally “wrapped item”) is a very interesting tea to categorize. 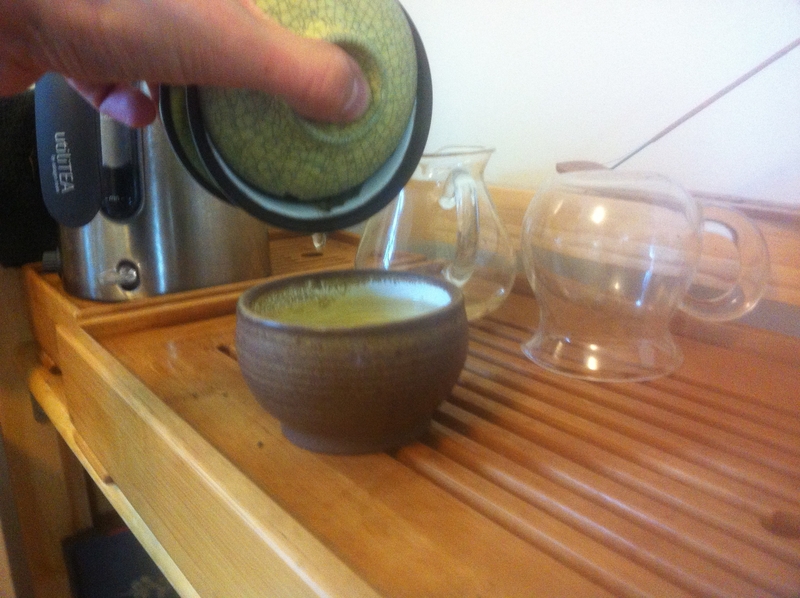 It balances on the border of being Green and Oolong. Very lightly oxidized, bright and floral, green and tan, it is one of the oldest styles of tea produced in Taiwan. When I think of Taiwanese oolongs, I usually imagine the sweet roasts of Dong Ding, or the high floral scents of Ali Shan. It’s easy to forget the humble twisted leaf grown in Taipei when confronted with all the miracles of the Taiwanese Tea Research Institute growing in Nantou and Chiyai. Despite various spellings of the name (e.g. : “Pouchong”), Baozhong is pretty obvious when you see it. Most oolongs from Taiwan are of the rolled style, meaning that they are rolled during their lengthy processing into small balls which open up upon steeping to reveal three, four, or five leaves attached to a soft stem. Baozhong, however, is twisted into a sort of curl of one or possibly two leaves (the size of which varies based on the leaf) and you’ll rarely find more than the hint of a stem. 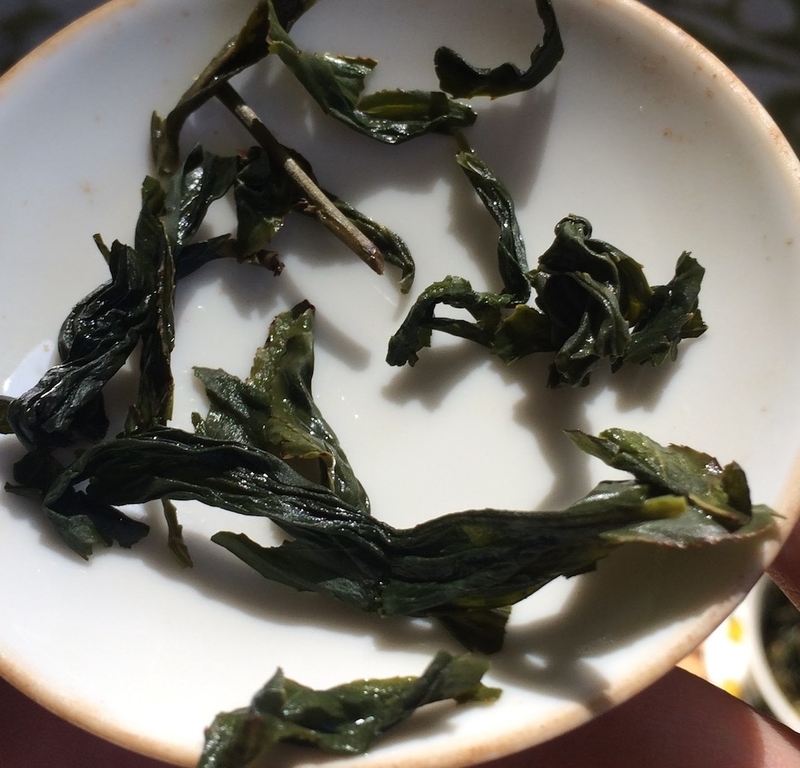 The leaves are usually a bright green that immediately makes me think of a green tea, and indeed the oxidation level for Baozhong is only 5-15%, making it closer to green tea than any other oolong. To the best of my knowledge, almost all modern Baozhong is grown in and around Pinglin, a region in the Wenshan mountains within the borders of Taipei. It’s a place which I’ve actually had the good fortune to visit. As with most tea growing areas, the people I encountered there were very friendly and welcoming, especially when they learned that I was visiting because of their tea! Today I thought I would compare a few examples of 2013 Baozhong that I have in my cabinet. 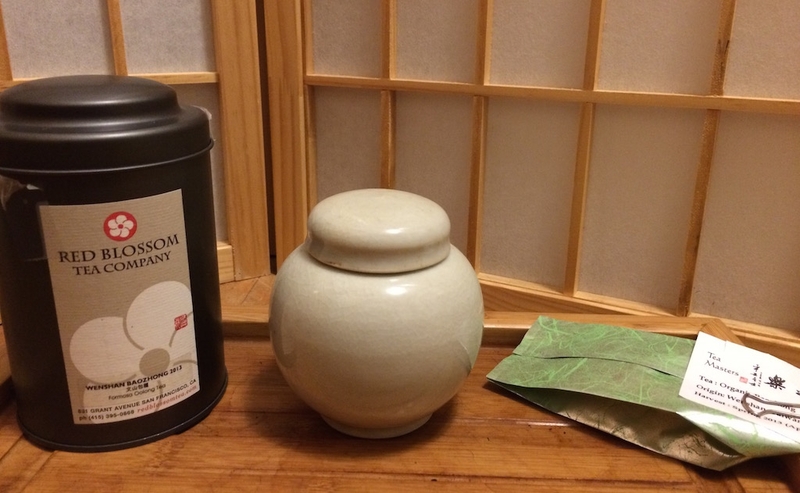 The first is from Red Blossom tea in San Francisco. It was purchased a year ago and has been resting in a double-lidded metal tin since. Even though the leaves have only been exposed to the air at the infrequent times I’ve opened the tin, I had it in my head that the leaves had lost a lot of their luster and energy. Many oolongs can retain their greatness for several years after harvest, but Baozhong is so close to Green tea that I feared its magic had been depleted by time. I was pretty pleased to discover that I was wrong about that. I infused 4 grams of leaf for about 1.5 minutes with 90°C water in a gaiwan and was greeted by a floral aroma and brightly energizing tea! A very impressive feat given its nearly 2 years of age. The second tea I tasted was actually the same tea from the same purchase, but had been stored differently. Following some advice from Stéphane Erler, four or five months ago I had moved a good amount of the tea from its metal tin to a ceramic jar to see what effect it would have. Today I opened the jar to a wonderous aroma and was excited to compare it to its near cousin. As you might expect, the tastes were very similar, but there were notable differences. First, the liquor of the tea from the ceramic jar was a shade darker (and remained so at every infusion) despite identical measures of weight, gaiwans, and water. I brewed these very close together to see if I could spot anything unique and to minimize any variations. 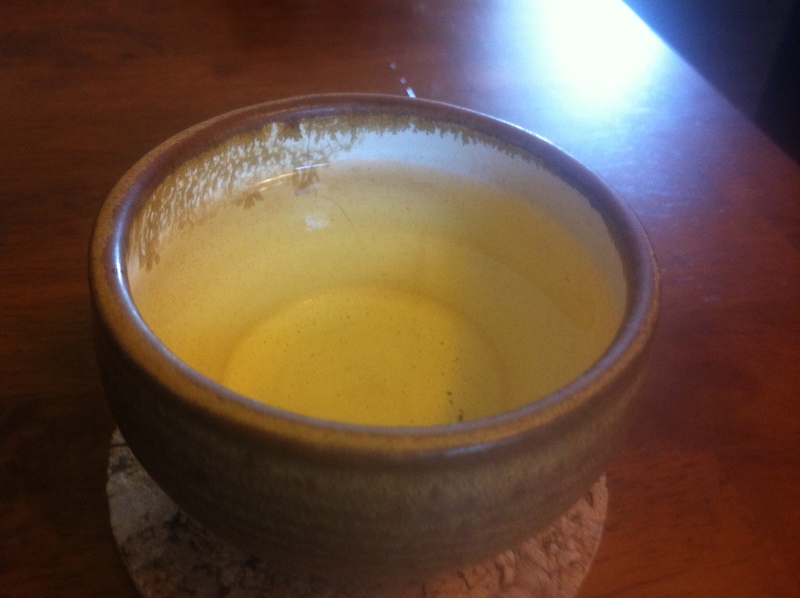 Secondly, the ceramic jar Baozhong had a deeper, richer flavor than its metal-tinned version. The floral notes were much the same, but the mouth-feel was decidedly changed by its container. This is a fascinating experiment that I hope to repeat in the future! The third tea I tasted was also a Baozhong from 2013 although just purchased recently from Teamasters. Its leaves were dramatically larger and darker than the Red Blossom tea and in fact barely fit in the gaiwan I was using. After the second infusion I removed one third of the leaves to allow the remainder to open and move about. I try not to get too far into “tea dogma”, but if my experiences are anything like yours let this be a lesson as you explore the tea world: if your gaiwan or pot is overflowing with leaves, it will dull the taste and make for a strong and blunt cup. Best to remove a few (or a lot!) of the leaves and until the remainder can swirl about efficiently. This Baozhong was dramatically more buttery and smooth than the others, making my mouth water at each sip. The buttery quality of tea is hard to describe unless you experience it, but this one was sweet and thick like cream. I’m very glad that I ordered it! All three gaiwans gave me two good infusions and a third that was still tasty if faded. I might have been able to coax a few more from the leaves, but after drinking three infusions each of three teas I had consumed more than enough for one sitting! I bow deeply to the farmers in Pinglin for growing and crafting these unique leaves and to Red Blossom and Teamasters for giving me the chance to hold them in my cup. 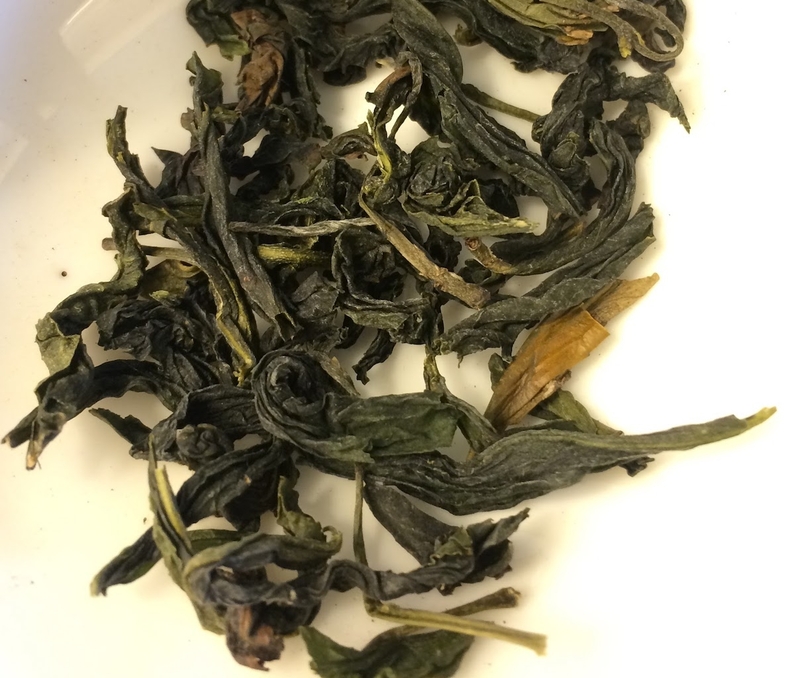 This entry was posted in Tastings and tagged baozhong, oolong, pinglin, redblossom, taiwan, teamasters on October 28, 2014 by payton. This is the second tea I decided to test in my grand (old) tea tasting experiment of this summer. Another from Taiwan in 2011, drinking this tea is always a step back to rural Pinglin. We had taken a bus to the town hoping to find a plethora of tea shops, but we were surprised at how quiet it all was. Just next to our bus stop, we found one of the ubiquitous shops that occupies the bottom floor of a two-story house with a large garage door. When the garage doors are closed (and sometimes when they’re open! ), you can never tell if it’s someone’s living room or a shop. In this case, it was a family tea business. A husband and wife bustled around amid a hundred large plastic bags of tea that filled all available space, while the grandmother sorted some tea in the corner and kids ran about in back. The eldest of the children spoke some english, so when our intention was made clear, he was the one to serve us some tea on a beautiful tea table hidden behind some piles of dried Bao Zhong leaves. Not only was the table beautiful, but the family had quite a collection of teapots and gaiwans as well. The tannin-stained matte textures on the yixing showed quite clearly that they had seen many years of good use. We had many good pots of tea at that shop, and purchased plenty to take back with us. My favorite was a roasted Bao Zhong which is the subject of this post. What’s interesting about this tasting was that I had apparently saved the tea in several places. I have the original foil bag, still about one quarter full, and I had two different small tins which I use when traveling. The tins are good quality and both seal quite well and yet when I infused the tea from those, it was bland, and only a distant memory of that roasted oolong from which it came. I had planned to mark off the rest, but when I came across the bag, the tea inside had such a delightful aroma that I just had to try again. I’m glad that I did! 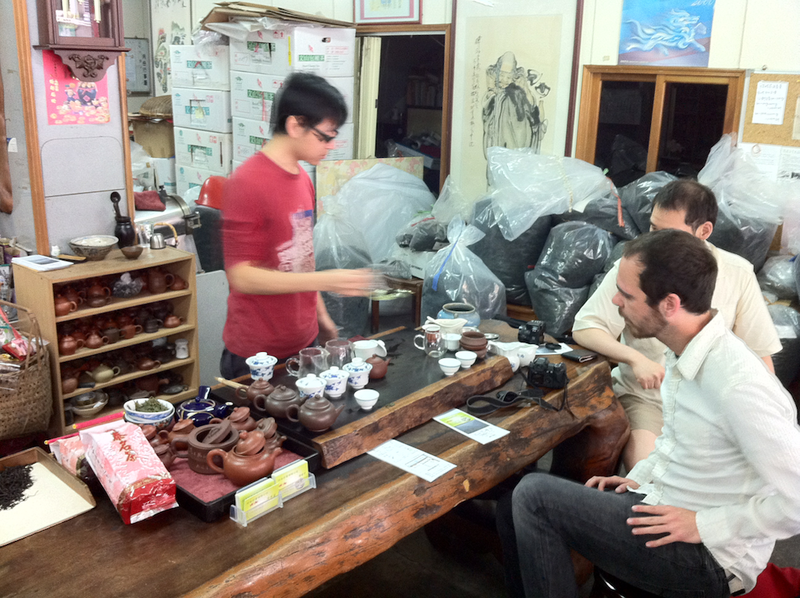 The aroma was the same that you smell walking around Pinglin or Maokong, sweet roasted tea. I can hardly explain what it’s like to be surrounded by it. It infuses you. If you’ve ever had the opportunity inhale the aroma of a pot of quickly heated roasted oolong, you’ll know what I mean. If not, the closest parallel that I can imagine is something like roasted chestnuts. Rich and comforting. In the mouth, the taste is flowery and actually seems to intensify as it cools. Bao Zhong is a lightly oxidized oolong and so it tends to do best at cooler temperatures. The overall experience is light but correctly so for a tea of this style. I think one of the difficulties that I’ve had with Bao Zhong is using sufficient leaves in the gaiwan, since they are twisted in a way that makes it appear as though you’ve got more in there than there really is. It may be that when tasting the other packages of this tea, I simply didn’t use enough leaf and the resulting tea couldn’t generate enough body to seem worth considering. I also wonder if the typical foil pouch has some qualities that perhaps make it a better storage medium than even an airtight metal tin. Maybe this tea really needs to breathe. This definitely gives me something to experiment with in the future. Altogether, this one’s a keeper. 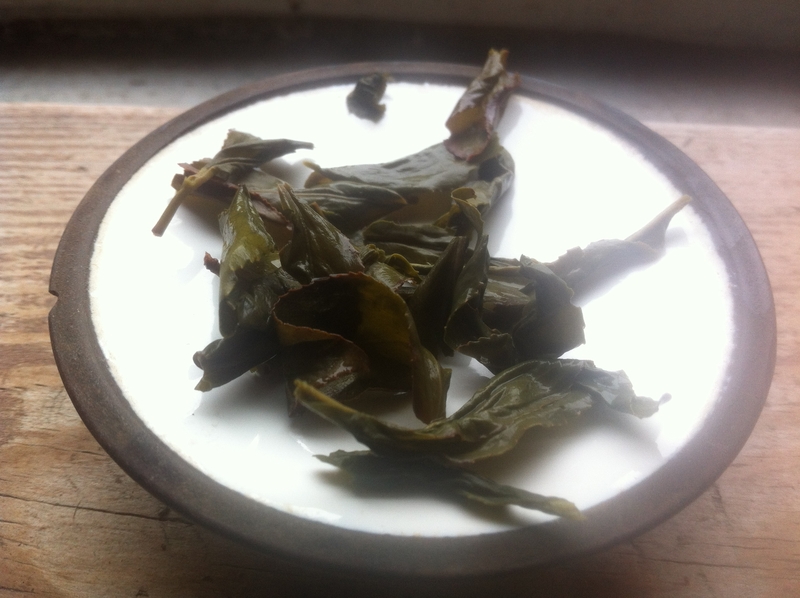 Really, it’s amazing that a lighter oolong such as this lasted longer than some of the rolled ones I’ve been trying. But that’s all just part of the mystery of tea, I suppose. Note: I’ve written about this tea before. 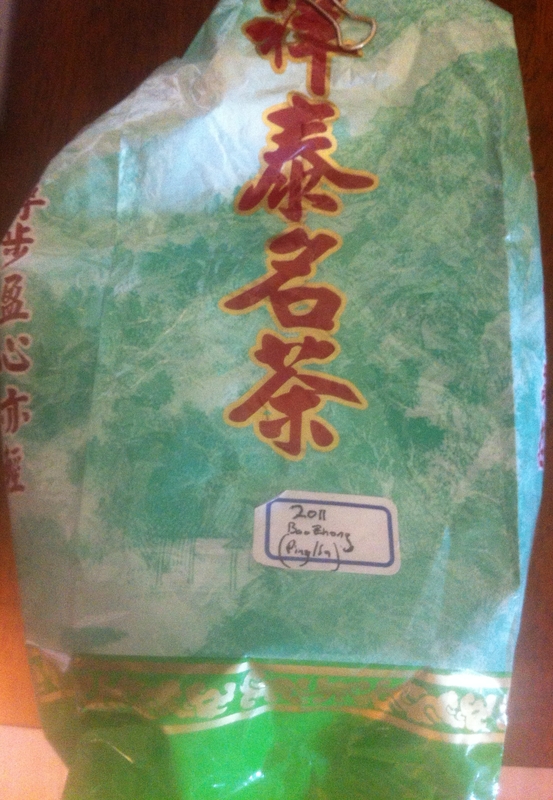 This entry was posted in Tastings and tagged baozhong, oolong, taiwan, tea on September 7, 2013 by payton. This post was originally written for Cha Xi Collective. Just keeping a copy here. Brewing this in Cha Xi for the early Autumn, sitting by the window with the pink and purple of the season’s last morning glories peeking in. Memories of distant sun-soaked Pinglin are coming out of the pot right along with the tea. 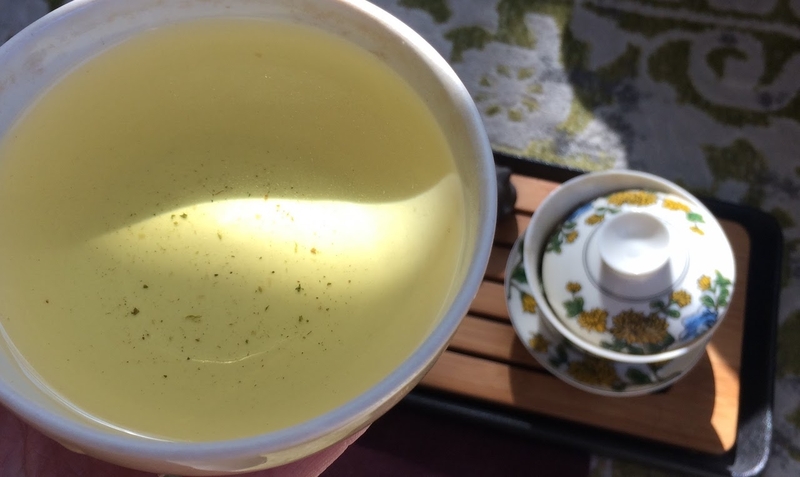 Knowing that the small town of Pinglin near the North-East coast of Taiwan was home to this iconic oolong, but little else, my friends and I muddled our way to the downtown bus that would take us there. When we arrived, we were surprised to find what looked more like a small village than the tourist-friendly tea town we had hoped for. There was even supposed to be a huge tea museum! Not dissuaded, we did what we usually did in Taiwan: walked about until we saw some tea and headed toward it. Right next to our bus stop there was a small shop (or house, it was difficult to tell the difference on the streets of Taiwan) that was filled to bursting with big bags of green leaves. After pushing our way toward the back, we were met by a very friendly family. The parents didn’t speak any English, and we had no Chinese to offer them, but we managed to communicate that we were interested in tasting some local oolong. Luckily for us, one of their sons, probably around high-school age, spoke some English and we were able to taste a wide selection of what they had to offer. It turns out there is quite a variety of taste, even among Bao Zhong (literally meaning “wrapped item”) teas produced by a single family. The oxidation level, date of harvest, the leaf size, and the level of roast all have a noticeable effect on the final product. Since this was the first tea shop in the entire town we visited, we bought a small amount of our favorites and then, emboldened by our success, headed out to see what other treasures we could find. After several hours of wandering the streets and trying a few other shops (or living rooms? ), it became clear that our first stop had been the best all along. We eventually returned to the first tea shop we had found and purchased some more recently harvested leaves, including this light roast oolong and a Green Bao Zhong for its freshness. As I’ve come to expect from good quality oolongs, this tea has aged well in its simple foil package, possibly improving in the year since its harvest. Sweet like green grass and honeydew. Gentle roast that joins “tea” to “melon” in my taste memory; it creates a texture and chewiness on the sides of the mouth. Golden-green color. Second infusion is more rich and less sweet. Tending toward the sweetness of a good light ale. I figured a bit longer in the pot would help to bring back the honeydew. The third infusion takes the sweetness and makes it into a bold statement rather than a gentle brush. Mouth-filling, it brings together the tastes of the previous two. About 45 second to one minute infusions with a decent amount of leaves. Brewed in my Yixing pot from Maokong, Taiwan, reserved for light roast oolongs. 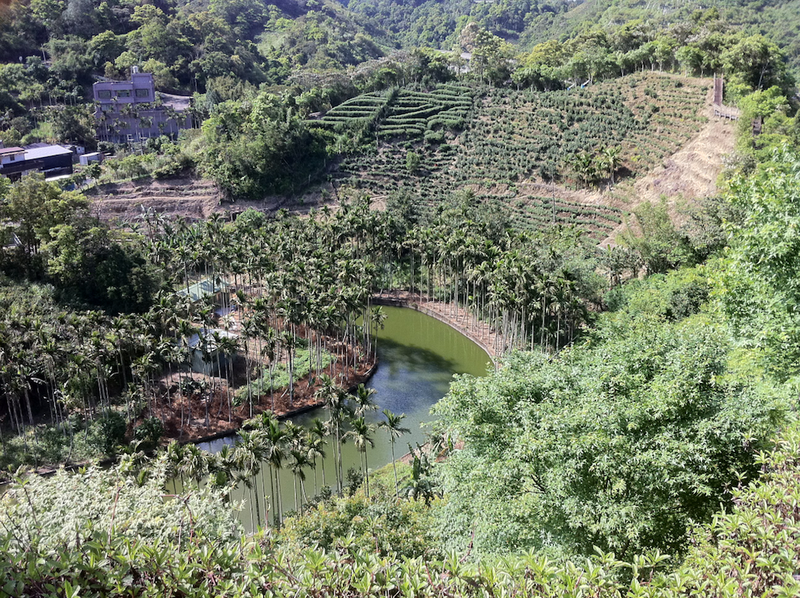 This entry was posted in Travel and tagged baozhong, oolong, stories, taiwan on September 26, 2012 by payton.